Our occupational therapists work to enable children to achieve a productive and independent life style. A holistic, child-centered approach improves performance of activities of daily living and work and leisure pursuits. Our goal is to help children succeed at the various tasks involved in growing to be independent, productive, and happy adults. The job of children is play. 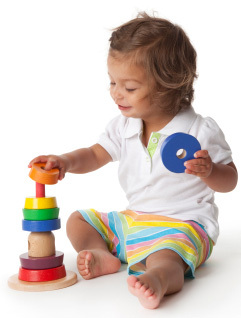 Children learn how to interact with objects, toys and people in their environment through play. Pediatric Occupational Therapy helps children learn or regain the skills they need to be successful in their school, home, and community. Occupational Therapy services include direct assessment and treatment, consultation with the family, caregivers, and others providing services to the child.